Blackpool and Luton had 33 draws between them in Sky Bet League Two this season and their two-legged playoff semi-final could begin with a stalemate at Bloomfield Road. Fourth-placed Luton lost the fewest matches in the regular season with only nine defeats but missed out on automatic promotion because they were unable to turn enough draws into victories. The Hatters were forced to share the spoils 17 times and when manager Nathan Jones assesses the campaign he will be sorely disappointed with draws against lesser lights Cheltenham, Newport, Hartlepool, Yeovil and Leyton Orient which proved costly. Jones likes his team to control matches and only champions Portsmouth (40) conceded fewer goals than Luton's excellent tally of 43 so they are clearly a difficult side to beat. Luton arrive by the seaside with only one loss in their last 11 games and that includes a slightly fortunate 1-0 success over Blackpool which came courtesy of a last-gasp Ollie Palmer finish. However, there is a reliance on Danny Hylton for goals. 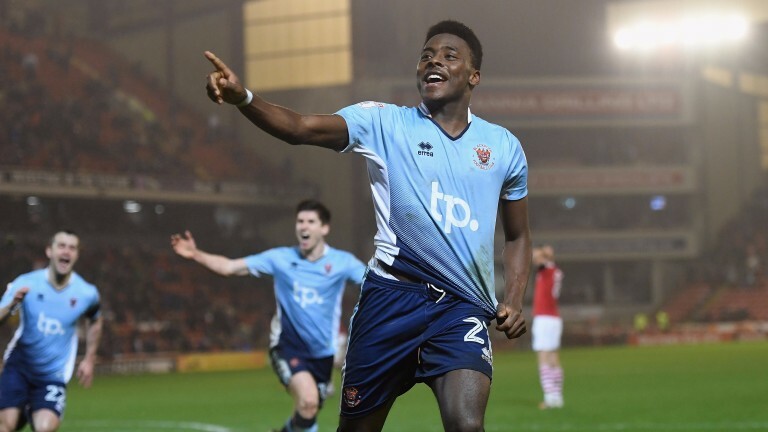 He notched 21 of their 70 goals in the regular season and was the only Hatter to reach double figures in League Two other than the injured Cameron McGeehan. Given the way Luton have played this season it would be no surprise if they settle for a draw before looking to kill the tie at Kenilworth Road and Blackpool may struggle to break through. The seventh-placed Seasiders had 16 draws themselves in the regular season and, much like Luton, are in decent nick. Blackpool have lost only five league matches since Christmas with Grimsby and Mansfield the only sides to have won at Bloomfield Road in 2017. That suggests the Tangerines are not put off by their sparse crowds due to the protest from fans against the owners but with Luton expected to have nearly half of the attendance it is not an ideal situation for Blackpool boss Gary Bowyer. Striker Jamille Matt could return for the hosts. James Justin, Johnny Mullins and Jordan Cook are doubtful but Alan Sheehan should return. Danny Green lacks match fitness and Cameron McGeehan is sidelined. Luton have won their last six matches against Blackpool.